Taking care of a senior with Alzheimer’s or Dementia can become difficult, depending on the severity of the condition. 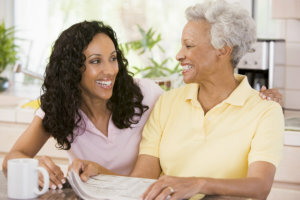 However, our caregivers are highly experienced and trained in giving Alzheimer’s and Dementia care. They know how to handle different situations that may happen to a client with this condition. All of these are signs of Alzheimer’s. With Alzheimer’s our loved one is still occupying the same body, but they are no longer the same person. Precious memories are lost and no new memories are gained. We look at the person who has meant so much to us and ask, “Who are the now?” They don’t recognize us. We grieve. At the same time, we remind ourselves that it is not about us. The shared love and memories are still a part of us. Our care providers are trained to give compassionate care while preserving your loved one’s dignity. Trust our highly experienced caregivers to provide the care and needs of your loved ones with dementia. Our offices are in Walnut Creek, but our caregivers work throughout the East Bay. Call us now at 925-948-8432 or 510-394-0003.